Calvinistic Methodist chapel built 1864. 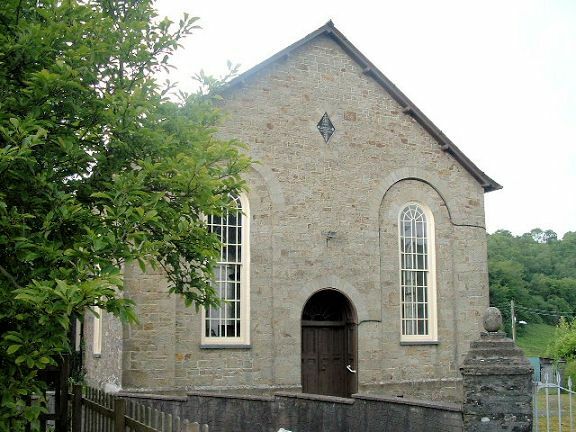 I replaced an earlier chapel of 1794, set up by the Lloyd family of Bronwydd. Squared rubble construction. Slate roof, timber eaves and bargeboards . Low plinth. Three bay gable front. Wide central round arched doorway with pared 6-panel doors, panelled reveals and radiating fanlight with some coloured glazing. Dressed stone voussiors. Tall round arched window each side, each with in similarly arched recess, 45-paned horned sash windows with radiating upper glazing. Dressed stone voussoirs. and slate sills. Lozenge-shaped tablet to gable inscribed: "Capel y Drindod. Adeiladwyd 1864". Three similar windows to each side and two to rear. N side with C20 brick lean-to at right end. Flat plaster ceiling with large central plaster rose and four smaller plainer roses towards the corners. Moulded plaster cornice. Box-type pews with doors (except those towards rear of side ranks): brass numerals. Panelled canted front to big seat. Elaborate veneered serpentine fronted pulpit; panelled lower section, central panel above with short balustraded flanks. Balustraded outer bays returning to curved staircases: turned balusters and square newels with ogee finals. Rear lobby widow with centre lozenge pane and coloured marginal glazing. Listed as a well designed rural chapel with unaltered interior. Capel y Drindod is prominently situated on steep slope in village centre. Gate in front of chapel. Prominently situated on bend of A475 (N side), in centre of Aberbanc. Prominently situated in village centre. Prominent village site on steep bank, S of A475. Situated 60m N of junction of B4334 and A475 at Aberbanc, carrying the B4334 over Nant Gwylan. Situated on E side of A475, 0.3kmS of Aberbanc. Freestanding.